This is gorgeous and sounds delicious!! Do you have time to post the recipe? Erm...maybe. It's a long one and I will have to tweak quite a bit as there are holes in it! I have a lingering, curious aversion to fruitcake. Perhaps, sine it's been at least 50 years since I've given it a shot, I need to make one of my own. I think your frosting is a fitting finish for such a burley loaf. Burley. Don't see that word often, and then I did last night, in the Faulkner novel I am reading. Does Mustafa ever make it to Denver? 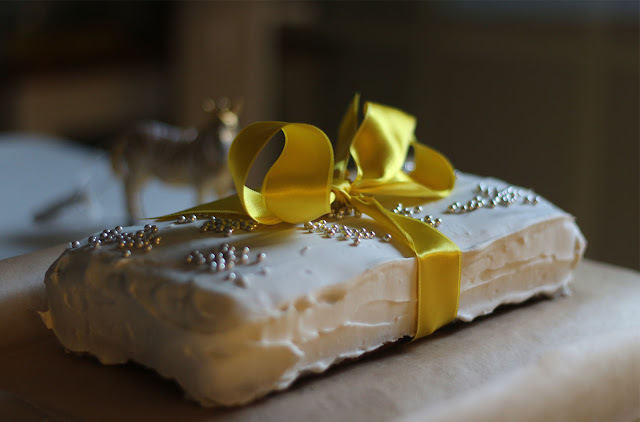 I'm craving some of that gorgeous ribbon! And would he sell me some even if I (and all my family) still say, "Constantinople?" I've always liked a bit of poufy whipped cream on warmed-up fruitcake. A lovely post; thank you for taking the time and oh yes, indeed! With Brandy! I don't see Mustafa making it to Denver! Thank you, as always. Beautiful fruitcakes. I made 8 this year. I find a well aged cheese and a glass of port goes very nicely with fruitcake. Hmm, 8 - that's a lot. This cheese thing is quite new to me. Looking forward to trying it. Beautiful. Mr. Capote would be pleased. Shortbread and fruitcake are two must haves this time of year, everything else (mincemeat, steamed pudding, trifle, more cookies and candies) is negotiable, but nice. 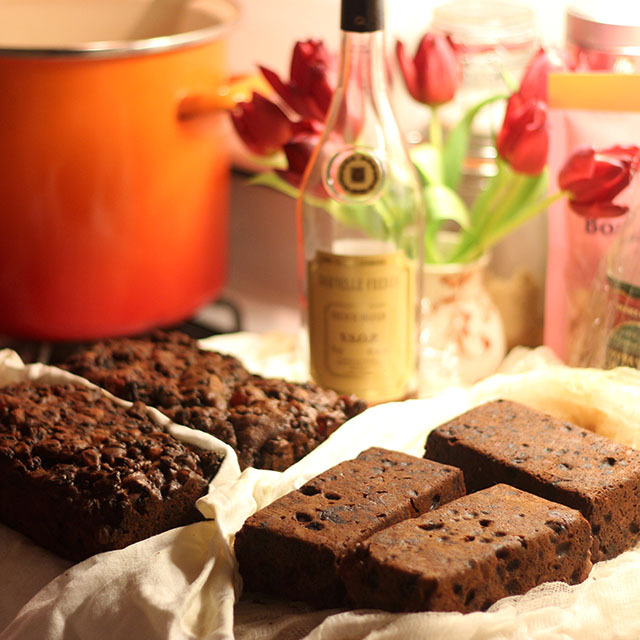 I always make a half batch of my mom's fruitcake recipe since she passed away a few year's ago. A nice connection with the past. It makes two large, that are enough for my Brother, SIL and myself, plus the odd visitor. Perfect winter treat with a strong cup of tea or coffee for the next few weeks. While making the rounds gathering ingredients, one of the packaged diced mixed candied fruit listed rutabaga as the main ingredient. I suppose it would be okay. 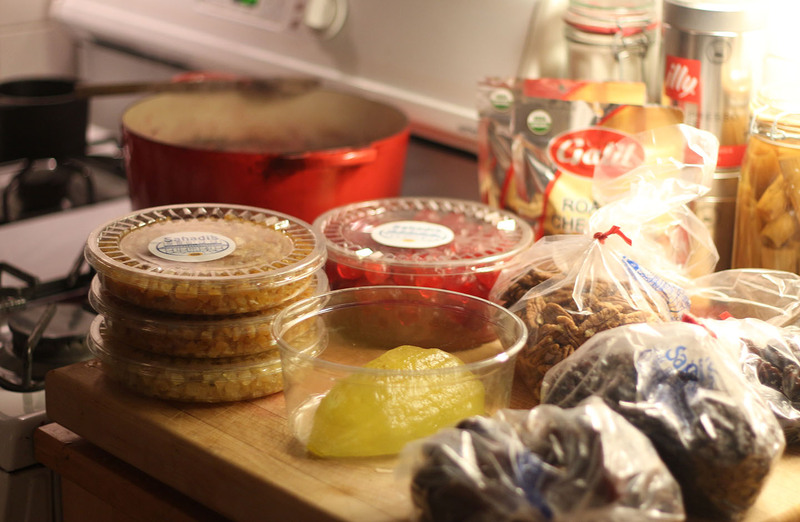 I opted for candied orange, lemon and citron, along with glace cherries (red and deep green), currants, two kinds of raisins, dates, almonds and walnuts. I always follow the recipe exactly, I even need to buy the specific not-very-fancy brandy, despite having several bottles of better at home. I always like your comments, Jake. Mr. Capote's short story "A Christmas Memory" is a seasonal must read, makes one a bit teary/sniffle-y tho'. 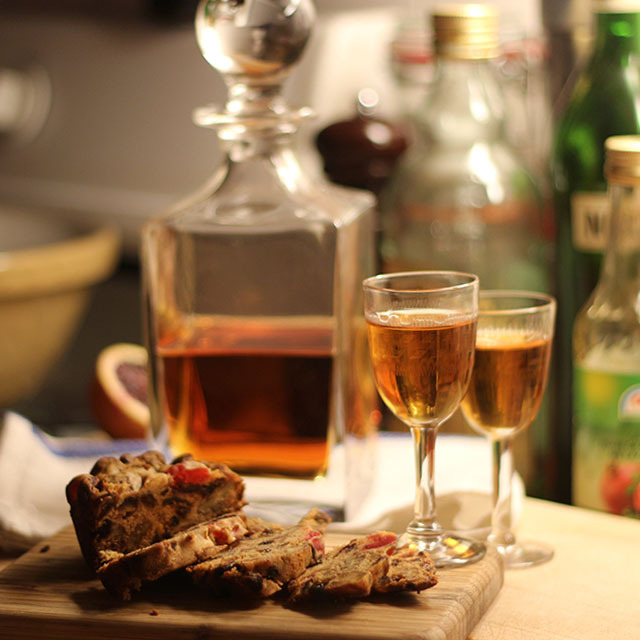 A sampled my fruitcake last night - a supper of old cheddar, fruitcake and scotch. Yummy. A Snowy morning here in Alberta. Yes, winter helps, a lot. Neither my friends or family like the glace fruits so I've experimented with dried fruit. I take raisins, and mixed dried fruit and soak them overnight in rum. The I make a batter with cinnamon, nutmeg, four, brown sugar and eggs. I add the fruit and any left over rum from the soaking and bake in a low oven. Once the fruitcake is cool, I wrap it in rum soaked cheesecloth, then in clingfilm and store it in an airtight container. The longer it ages the better it tastes. The method sounds very very similar. Most of these fruits were just dried, not the cherries and citron, of course. And yes - brandy-soaking was involved. Marie, I love your idea of giving fruitcakes as gifts.. Here in Virginia, fronting the sylvan Shenandoah River in Clarke County, there is an Abbey wherein the congenial, friendly monks sell their annual fruitcakes. One must drive there (Holly Cross Abbey--a bit remote) and pick up the cakes as the monks do not ship their splendid little gems. But this loverly Abbey--located in such a magnificent setting--is the kind of place that once you visit, one seeks an excuse to return. So, thanks to a reminder from you, I'll head over and see the monks this weekend before heading "up north" for the Holidays. And several gifts will soon be in hand. Looking forward to your trip to these parts! The days in the life of a fruit cake - they are beautiful and I'm sure they are going to make some lucky people very happy. Maybe keep a tiny one for the next time you come here ? Thanks for the tip, Lisa. I do have access to dried cherries, but King Arthur's are not ye olde glacé - which I kind of like for these cakes. I love fruitcake, especially if it's full of walnuts. When I make them, I double the cake recipe. And yes, wrapping them in cheesecloth sprinkled with brandy is a treat! I have not tried with walnuts - next time! Sounds wonderful. What do I have to do to get on your gift list? Sounds yummy. Aren't you going to post the recipe? Would love to have it.